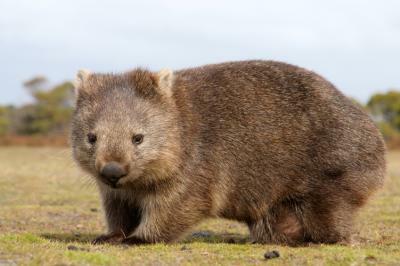 Patrick the wombat lives in the Ballarat Wildlife Park near Melbourne, Australia. The park specializes in the native wildlife of Australia and has exhibits and educational programs to help promote understanding of Australia's unique animals. For Patrick's 30th birthday, his assistants opened a profile page for him seeking love on the dating web site Tinder. It seems even in this special wildlife preserve, finding a like-minded companion isn't easy. Patrick also has a Facebook page and with his admirable characteristics (88lbs, short, squat, fuzzy and completely adorable) we are sure, given this digital push, he will find wombat love soon. When it comes to community bank small business clients, however, not everyone is keeping up with the times as readily as Patrick. A recent Wells Fargo survey of small businesses found that 51% of those that accept point of sale card payments are not aware of the change in chip card liability that kicks in Oct 1. This is important because so many small businesses do business with community banks and as of that date, card issuers and merchants who do not upgrade their point of sale systems to accept EMV cards assume liability for fraudulent transactions. The statistic is interesting, but what really caught our attention was that of those who said they were aware of the pending liability shift (49% of respondents), about 20% said they still did not plan to upgrade. They said they were not concerned about it, did not want to pay for the upgrade and were willing to take on the risk. That certainly gives one pause when you consider the potential ramifications and that this could spill over into loans made to these businesses. Bankers should note who may be at risk in their portfolios. We wandered into a local business to find a gift and in conversation with the owner, the subject of working with community banks came up. This business owner has been a long-time customer of a community bank that is now being acquired by a larger holding company. As we paid for our purchase, the owner said she was concerned about changing out credit card terminals in light of the EMV chip technology (this merchant knew about it and was trying to plan). The conversation offers some insight for community bankers working with their merchant customers around this very issue. Merchants are faced with variables like the choice of chip and signature, or chip and PIN, and then whether they want to upgrade to terminals that accept Apple Pay and other mobile based payment systems. This merchant has always purchased terminals in the past but wasn't certain it was the best idea now with rapidly changing technology. It does perhaps make sense in the face of rapid changes to not make long term purchases of equipment yet. It was also interesting to note that this storeowner has historically done all her merchant services through her community bank, but is now being solicited by numerous outside card services providers. One group that does not seem to be making much contact is the merchant services team of the acquiring bank. We have said it before and we will repeat it again. The shift to EMV chip cards is a reason for every community bank to reach out to every single customer. For individual retail customers, it should be explained that they will be receiving new credit/debit cards, when this will occur (many banks will not be meeting the Oct 1 deadline, especially for debit cards) and to explain that the new cards will offer additional security. For merchant customers, guidance on whether buying or renting terminals is better, what options are available for additional services and just to let your merchants know that you are there to help. Especially if your bank is acquiring another at the same time that the new card rules kick in, and especially knowing that independent card providers are knocking on your customers' doors, your bank should be calling on these customers. Otherwise, your bank may end up like Patrick the wombat - fuzzy and adorable, but lonely and working on his Tinder profile. Treasury yields ended unchanged despite high corporate issuance which drove yields higher initially. Import prices and wholesale inventories will give indications on the future of commerce activity. 1) Washington State Bank ($233mm, IA) will acquire Columbus Junction State Bank ($52mm, IA) for an undisclosed sum. 2) Nicolet National Bank ($1.2B, WI) will acquire Baylake Bank ($980mm, WI) for $141mm in stock. Bankrate has agreed to pay $15mm in fines to settle SEC charges alleging it committed accounting fraud to improve quarterly earnings performance. The latest Fed information shows consumers took out more non-mortgage consumer debt in July, as jobs and economic conditions strengthened. During the month, auto and student loans rose to a 7.0% annual rate while credit card debt climbed to a 5.7% annual rate. A survey by recruiting firm Kelly Services finds 31% of workers in the US consider themselves free agents, saying they don't want to be locked down to just one boss. By demographic, 36% of boomers say they are free agents, compared to 26% of millennials. The European Central Bank downgraded its inflation forecast and its President said there was room to expand its current $1.1T bond buying program currently in place to boost quantitative easing (economic stimulus) efforts. The IMF is warning central bankers worldwide that it is still too early to raise interest rates given so many risks to global growth. The IMF is worried rate hikes could negatively impact weak economies.